Ladies and gentleman and I use gentlemen loosely...dirty dogs! It was great to see all the Giants Fans from Texas, New York, and New Jersey at the tailgate prior to the game against the Cowboys. The mood was set right outside the Cowboys home in Arlington. Giants came... Giants saw...Giants conquered ...AGAIN! Eli is 2-0 in the cowboys new home I refer to as the Tarrant County Colosseum. 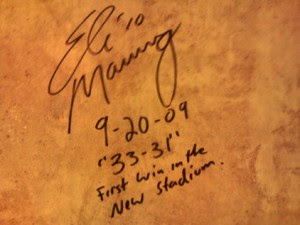 Eli now owns property in Tarrant County, TX. I wonder if he marked his territory a second time? I think I even met the unofficial Governor of the Meadowlands Parking Lot wearing a Giants sports coat and a Giants tie. Good Luck on Election Day! Some Giants fans even read our blog...thank you for your comments. We love the comments. I also found out Big Blue DFW has hits from all over the World. The WORRRLD! Are they Giants fans? Are they lost? Or are they reading our blog every week like Peter? Madagascar- 2... "All Hail The New York Giants!" I'm writing this with tears in my eyes,my family and I came down here to Wales.United Kingdom for a short vacation unfortunately we were mugged at the park of the hotel where we stayed,all cash,credit card and cell were stolen off us but luckily for us we still have our passports with us. "I hope you rot in Europe. You should pay me to take you back." "How much do you need? Where do I send the money?" "Bizarre. Didn't sound like Mac but it was just weird enough with the Mac's Irish heritage twist that he MIGHT be over in that general area. It was a stretch but I had to ask." "Have fun on your trip"
"Just so you know, I would totally send you $5 to assist (but I'd deduct the postage cost first)." "Take pictures, I love Great Britain this time of year"